After you step on-board the vessel, the skilled crew on board take the dhow about 1km away from the shore by means of an engine, once out in the sea the engine is shut off and during a tense moment the skillful crew put up the sail, once the sail is in favor of the wind, the guest can sit back, relax and enjoy the peacefulness of the ocean as you hear the ripple of water on the sides of the dhow as it glides swiftly through the clear turquoise water. 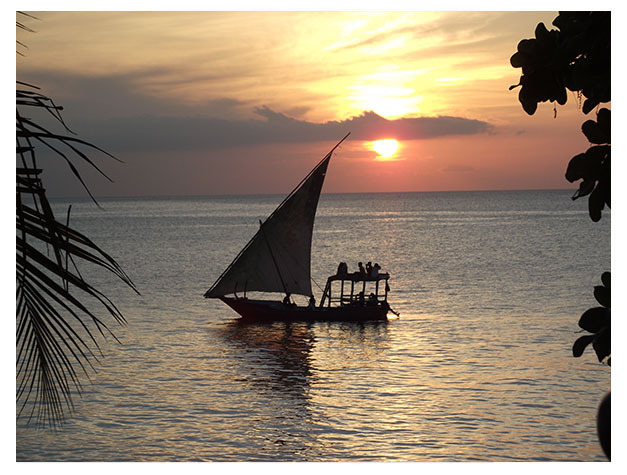 Our sunset cruises leave Stone Town in the late afternoon to cruise along the coast, slicing through the clear turquoise water. The sounds of the bustle of busy people in Stone Town grow faint in the distance until they seem there, only in a memory, as the dhow sail you will be served with sodas drinking water, and Zanzibar light snacks which will encourage you to sink back into the dhow bench and enjoy the romance of Zanzibar Island while the sun sets down with its beautiful orange colors. Your breath will be taken away by the wonder of the fiery golden-sun setting beyond the horizon as it makes the sky a magical canvas of shades of pinks, purples, blues and orange. 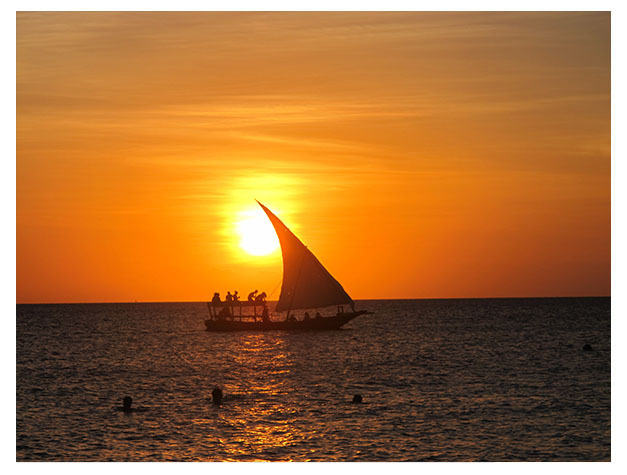 As you head back for stone town the wind gently blows into the Latin sail which is truly mesmerizing. On board our dhow we have a personal guide who will accompany you on your cruise and give you a tour of Stone Town from the water as well as be able to answer any questions that you may ask him. You will come back to the shore at 1830hrs to take your tax back to hotel.